Put the eggs in a pan of cold water, bring to a boil, and boil for 3 minutes (start timing as soon as the water comes to a boil). Drain and rinse under cold running water, then peel immediately. The shells come off very easily when the eggs are just cooked. Peel the asparagus stems with a potato of vegetable peeler if they are woody then cut the asparagus into 5 cm (2 in) lengths. Cook in boiling salted water for about 2 minutes until only just tender. Drain into a sieve and rinse thoroughly under cold running water, then pat dry with kitchen paper. Drain the artichoke hearts, reserving the oil. Cut the artichokes and eggs lengthways in half. 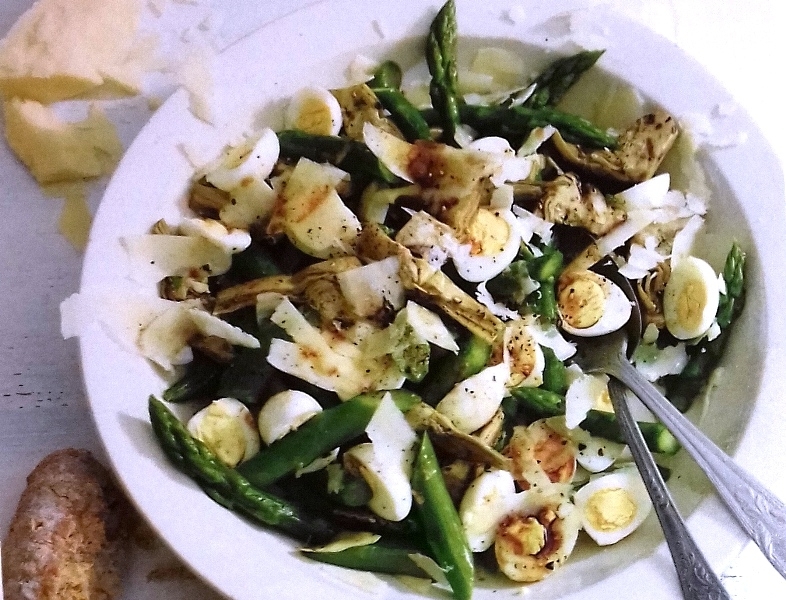 Divide the artichokes and asparagus among six plates, and top each serving with four egg halves. Make a dressing by mixing 3 tbsp of the reserved oil from the artichoke jar with the balsamic vinegar, and season with salt and pepper. To serve, drizzle the dressing over the salad, top with Parmesan shavings, and serve with crusty rolls.